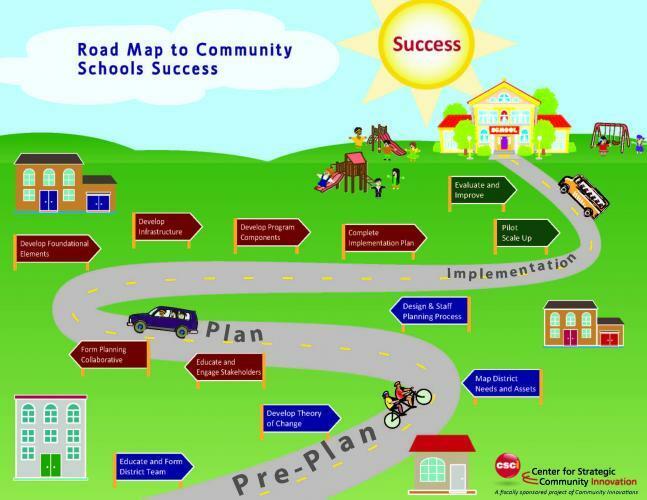 Community schools partnerships are strategies to improve outcomes for children, families and the greater community through enhanced access to services and support from non-profits, businesses, social service organizations and government agencies. Through collaboration, community schools partnerships enhance delivery of services and are opportunities for cost savings through intentional coordination. CCS Partnership takes the approach that community schools partnerships extend to city and county facilities as well as in the schools serving youth and families. Partnerships and collaboration can increase programs and services offered to families, and locations can be as diverse as the city park or library, county community center or a service organization’s clubhouse. Ultimately, an individual community schools partnership reflects the unique circumstances of the community in which the partnership is located. A community schools partnership may provide dental and health screening at the community center, literacy training at the school site for parents in partnership with the library, or after-school care at a non-profit organization’s facility. By coordinating resources, and communicating with families, the collaboration can improve how agencies provide services and the number of children and families being served. This toolkit is designed for local officials to learn about examples of partnerships in California that can serve as models for emerging or expanding collaborations. Examples are diverse in representing the experience of suburban, urban and rural geographies of California. In each jurisdiction, and even within communities, partnerships look different depending on available resources and the needs of children and families. One community may need to focus on financial resources for schools, while another may need to focus on health and well-being of students and families to keep students attending class. Other communities may need support for after-school services but already have resources coordinated for nutrition and health. Each community can assess its individual needs and opportunities and build a collaborative approach in addressing gaps. Assessing conditions and evaluating progress is essential in determining the success of a partnership. Highlighting the successes, lessons learned, and challenges of partnerships among local agencies and community-based organizations operating within the context of California’s unique financial and legal environments makes this toolkit unique. Toolkit content is based on the well-researched and developed materials of the community schools movement. This toolkit endeavors to bring these resources to the audience of cities, counties and schools that are working in concert to achieve success for youth and families.